Sleeps 2 to 4 guest with georgous mountain view and minutes away from beach. 'A slice of Heaven in Paradise' is what you'll find at Open Palms Plantation. Relax and enjoy the peace and serene island lifestyle. 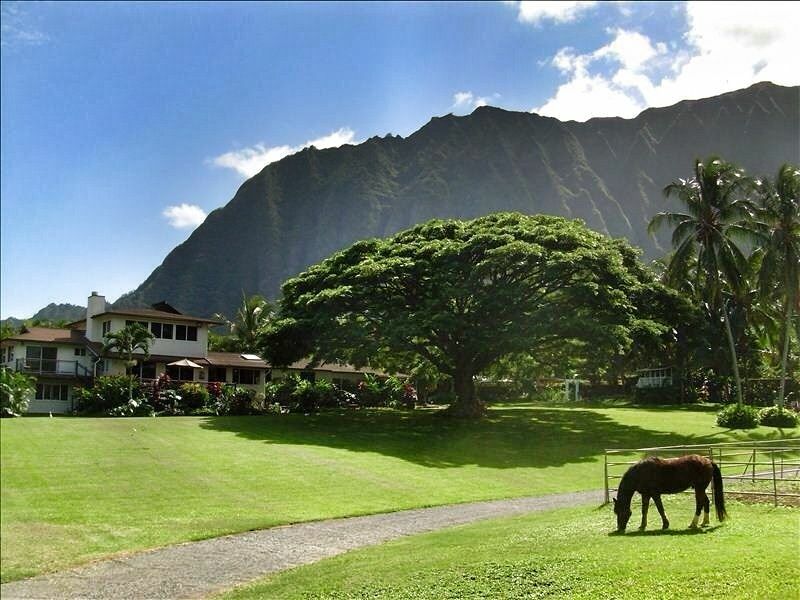 A beautiful retreat nestled in Oahu's horse country on a 2.5 acre plantation setting located at the base of the spectacular Koolau mountain range. We are just 3 minutes away from the 5 mile long pristine white sandy beach and turquoise water of Bellows and Waimanalo Beach, which was rated the #1 beach in the U.S. for 2015. A couple of the other top rated beaches, Lanikai and Kailua, are just 10 minutes away, and the infamous North Shore is 45 minutes away on a beautiful coastal highway. The unit has it's own private entrance outdoor dining and barbecuing area. Please visit our webpage at for full information on everything we have to offer. We are only 25 minutes from the Airport and 30 minutes from Honolulu and Waikiki. Easy access to all of Oahu's sights and adventures without the hustle and bustle of a tourist area. Restaurants,shops and cinemas are just 5 minutes away in Kailua Town. Like any polished jewel, Open Palms Plantation began as a raw, rugged part of nature, overgrown yes, but in a spectacular setting. There was beauty hidden in that wilderness and I was determined to create what I envisioned as a lovely home in harmony with its surroundings. Achieving a vision that had me spellbound didn’t come easy, taking years of hard work that I and my family actually performed with our own aching backs. And the result is a breathtaking two and a half acres of unpretentious, stunning contentment! Bonfires at twilight emphasize the romanticism that is Hawaii, giving us pause, to reflect on how fortunate we are. Open Palms Plantation is unique in that we are insulated from the noise and commotion of towns. There is a serenity and calmness enveloping us and yet we’re only minutes from Kailua with it’s shopping malls, restaurants and food courts, and entertainment venues. And the beaches from Kailua to Lanikai to Waimanalo are among the finest-rated beaches in the world! Sail, surf, snorkel, or simply stretch out on the white sands and stop the world for awhile (don’t forget the sunscreen). Because there are so many things to see and enjoy, I provide each guest with maps and lists of places of interest, making it easier for planning their days’ outings. When they return I love hearing the joy and amazement in their voices as they tell me of their adventures. Open Palms Plantation is just 1 mile away from a beautiful pristine beach. Located at the base of our island's magnificent Ko'olau Mountain Range. Air conditioner is a split system unit that is very quite and is capable of cooling down the living space quickly. All the best linens are provided for you and washed for you during your stay if needed. A private washer and dryer is available for you to use to wash your personal belongings. If you should need any fresh towels or linens, please ask. Private parking right by your front door. Ample towels are provided for both indoor and outdoor use. If you should need more, please don't hesitate to ask. Open Palms is very well stocked with everything you need. I have stocked the kitchen with everything you should need from pots and pans to tupperware. However, if there is ever anything you should need, please ask as I most likely will have it in my home. Induction cooking used here and it works great. My guest enjoy dining at the covered patio outside. However, there is a small extendable dining table inside the kitchen. Private covered outdoor patio for dining and BBQing. There is an ample supply of beach equipment for your use including beach chairs, umbrellas, coolers, snorkeling equipment, and boogie boards. I have a set of golf clubs available to use, please don't hesitate to ask. Air Conditioning plus Ceiling Fans, Cable TV and DVD, Full size Refrigerator, Fully equipped Kitchen, Double burner Cooktop, Washer and Dryer, Linens, Beach chairs,umbrellas, towels, and mats, Boogie boards,Bikes, Gas B.B.Q. Grill, Large Patio area, Private secure parking, California King size bed, twin bed, futon provided if needed, Privacy, lots of privacy. Tucked away at the base of the Ko'olau Mountains, you are located in one of the most pristine and peaceful environments on the island, and yet, only a two minute drive to Waimanalo Beach, the #1 rated beach in the US for 2015. Downtown area and Waikiki are located just 25 minute drive away if you feel the desire to have a night out on the town. Additionally, you can spend a day on the historic North Shore watching the surf and enjoy the stunning 45 minute coastal drive around the island.